Algeria has abandoned more than 13,000 people in the past 14 months, including pregnant women and children, stranding them without food or water and forcing them to walk, under temperatures of up to 48 degrees Celsius. 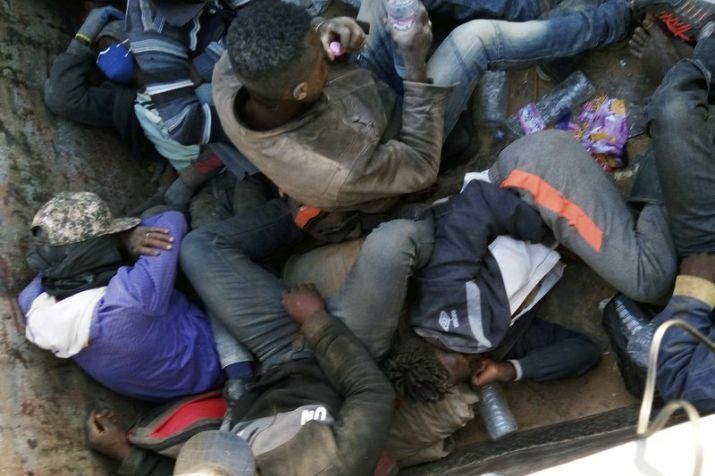 Migrants being expelled from Algeria lie in a truck headed towards the Niger border at Point Zero, from which they must walk south into the Sahara Desert towards the Nigerien border post of Assamaka, 10 miles south. Algiers, Algeria: From this isolated frontier post deep in the sands of the Sahara, the expelled migrants can be seen coming over the horizon by the hundreds. They look like specks in the distance, trudging miserably across some of the world’s most unforgiving terrain in the blistering sun. Here in the desert, Algeria has abandoned more than 13,000 people in the past 14 months, including pregnant women and children, stranding them without food or water and forcing them to walk, sometimes at gunpoint, under temperatures of up to 48 degrees Celsius. In Niger, where the majority head, the lucky ones limp across a desolate 15-kilometer (9-mile) no-man’s-land to Assamaka, less a town than a collection of unsteady buildings sinking into drifts of sand. Others, disoriented and dehydrated, wander for days before a U.N. rescue squad can find them. Untold numbers perish along the way; nearly more than two dozen survivors interviewed by The Associated Press told of people in their groups who simply could not go on and vanished into the Sahara. Her body still aches from the dead baby she gave birth to during the trek and left behind in the Sahara, buried in a shallow grave in the molten sand. Blood streaked her legs for days afterward, and weeks later, her ankles are still swollen. Now in Arlit, Niger, she is reeling from the time she spent in what she calls “the wilderness,” sleeping in the sand. A European Union spokesperson said the EU was aware of what Algeria was doing, but that “sovereign countries” can expel migrants if they comply with international law. Unlike Niger, Algeria takes none of the EU money intended to help with the migration crisis, although it did receive $111.3 million in aid from Europe between 2014 and 2017. “There were people who couldn’t take it. They sat down, and we left them. They were suffering too much,” said Aliou Kande, an 18-year-old from Senegal. Kande said nearly a dozen people simply gave up, collapsing in the sand. His group of 1,000 got lost and wandered from 8 a.m. until 7 p.m., he said. Kande said the Algerian police stole everything he had earned when he was first detained — 40,000 dinars ($340) and a Samsung cell phone. “They bring you to the end of Algeria, to the end in the middle of the desert, and they show you that this is Niger,” said Tamba Dennis, another Liberian who was in Algeria on an expired work visa. “If you can’t bring water, some people die on the road.” He said not everyone in his group made it but couldn’t say how many fell behind. “Our geographical position is such that today, we are directly in the path of all the expulsions of migrants,” said Arlit Mayor Abdourahman Mawli. Mawli said he had heard of deaths along the way from the migrants and from the IOM. Others, he said, simply turned right round and tried to return to Algeria. “So, it becomes an endless cycle,” he said wearily. With no name, no confirmed nationality and no one to claim him, the man had been in Arlit for more than a month. Nearly all the rest would continue south mostly off-road to Agadez, the Nigerien city that has been a crossroads for African trade and migration for generations. Ultimately, they will return to their home countries on IOM-sponsored flights.